LONDON — Discount airline easyJet warned Monday that the U.K.'s pending withdrawal from the European Union is causing travelers to hold back on booking tickets amid doubts over what Britain's future relations with the bloc will be. EasyJet said that as a result, its earnings would be weaker in the second half of the year. Its first half loss of 275 million pounds ($360 million) was within expectations, but the outlook for the six months through September is "more cautious." "For the second half we are seeing softness in both the U.K. and Europe, which we believe comes from macroeconomic uncertainty and many unanswered questions surrounding Brexit which are together driving weaker customer demand," easyJet CEO Johan Lundgren said. "We are rolling out further initiatives to support our trading." Shares in the company fell almost 10% in London on the news. Shares in other airlines and travel companies also fell, with British Airways owner IAG down 1.6% and travel group TUI 2%. George Salmon, an analyst at Hargreaves Lansdown, said the airline is facing issues with "two main moving parts," — namely fuel prices and customer sentiment. He said higher fuel costs are hitting profits and Britain's pending EU divorce is making customers think twice before booking trips away. 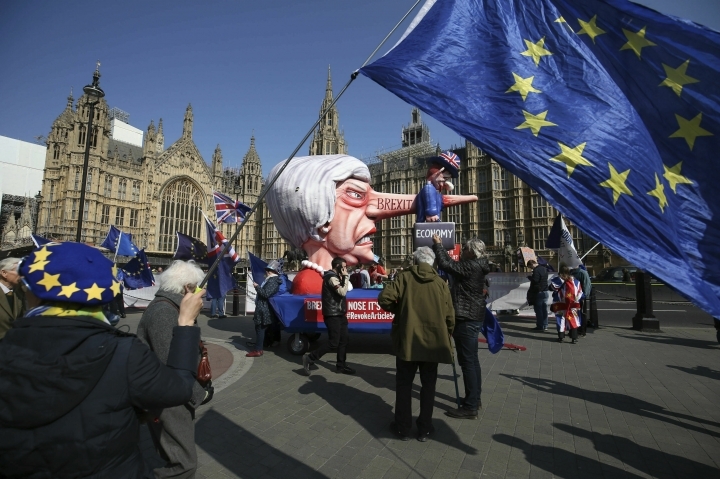 "The group reckons demand will pick up later in the year, but a more pragmatic observer would say it's difficult to put a timeframe on when (the U.K. government) and the EU will solve the Brexit puzzle," he said. "This uncertainty means easyJet requires some blue sky thinking just now."